TSI: Almost 40 Tibetans including monks have attempted self-immolation since 2009. Why this sudden increase in such desperate acts of protest? Have they lost all hope for a free Tibet? LS: [Brief silence] Yes, it has been really unfortunate. Question is why? The Chinese Government doesn’t allow any form of free speech like we see in India, here we can have dharnas, hunger strikes, and we can protest, and organise rallies. But in China, especially in Tibet, it is not so. You simply cannot participate in protests, even if it’s a gathering of three people, they get arrested and tortured. Tragically, Tibetans are taking to this rather drastic political act of self-immolation. But all the 40 self-immolators have only hurt themselves and not harmed others. Their demands are pretty clear – the return of His Holiness Dalai Lama and Free Tibet. TSI: Tibetan activist Jamphel Yeshi also self-immolated himself hours before Hu Jintao’s arrival in March this year. Is self-immolation the only way of being heard? LS: We have told people not to indulge in self-immolation. A few days after Jamphel Yeshi’s self-immolation we in fact issued a very strongly worded letter asking Tibetans-in-exile particularly not to resort to self-immolations because we have freedom of speech in India. We can resort to and engage in many other forms of protests. Unfortunately, Tibetans inside Tibet don’t have any other option, but to commit self-immolations. TSI: Have the concerns over Dalai Lama’s security intensified of late? The Dalai Lama himself recently said that a Tibetan may attack him? LS: Threat perception always remains. The report (about a Tibetan attacking Dalai Lama) is reliable but not verified. Reports are that China at one time was training people like that, so we have to take all this under consideration. TSI: Your views on Indo-Tibetan relations? LS: Tibet is of major interest for India from geo-political, environmental and cultural point-of-view. Culturally, because we follow Buddhism, which we adapted from India. Environmentally because Tibet’s Himalayan geography directly affects the region. And geo-politically because China is building a railway line all the way to India. The Indian government spends billions of dollars for border security. Before 1959, it was not necessary. Resolving the Tibet issue is in India’s interest. TSI: Is there any ongoing back-channel dialogue with China or does a stalemate persist considering recent resignations of your two appointed emissaries? LS: At the moment it is a stalemate, mainly because of the Chinese government. The relevant Chinese officials have not reciprocated positively to the memorandum that we submitted. That is why our two appointed envoys resigned. The environment is not conducive for dialogue. The situation inside Tibet is also getting worse. Having said that, we are ready to engage in dialogue with the Chinese government anytime. We seek autonomy within China and within the framework of the Chinese constitution. Most likely with the changes in leadership, by early next year there might be slight changes in the trend. TSI: China has been showing off Gyaltsen Norbu, the government-appointed 11th Panchen Lama, to the world. Do you think the world has accepted him as Dalai Lama's successor? LS: No, No I don’t think the world will accept him because he is not the boy endorsed by the Dalai Lama. He spends more time in Beijing than in Lhasa. He spends more time talking of politics than spirituality. He is being groomed and shown around by the Chinese government which will not be accepted by Tibetans. Why should they? TSI: If not Gyaltsen Norbu, do you think period after Dalai Lama will mean chaos for Tibetans-in-exile and China will only emerge stronger? LS: Dalai Lama will come back. But interim period, it was chaotic before. You know, there is always a gap in history. That is why His Holiness has issued a very strong statement last September – reincarnation, selection or emanation. If he comes back through reincarnation then till Dalai Lama is born and enthroned and mature, it will take 27 years. That is why, the Dalai Lama has said that if Buddhist leaders are willing there could be a selection process, some Buddhist leaders could gather and select the next leader. Or there is also the possibility of an emanation process, meaning the Dalai Lama could designate a boy (or a girl), and say he will be my successor. That will remove that interim period. Immediately after His Holiness passes away, we will have a young boy who will be the 15th Dalai Lama. Who better than Dalai Lama to choose, legitimize, give credibility, train and groom the next Dalai Lama? TSI: What is your single-most-important task as the PM of Tibetan government-in-exile? LS: Politically, restoring freedom for Tibetans and maintaining solidarity both within and outside Tibet are very important. Domestically, education will be the number one priority. I came from a humble background. Because of education I’ve managed to stand on my feet. Similarly, if we invest in education for everybody, then an educated and highly talented generation will be groomed to take forward the Tibetan cause. TSI: But is the Dalai Lama refraining from being too outspoken about the situation in Tibet these days? LS: His Holiness made it very clear last March that he wants to transfer all his political authority. There is a clear demarcation and I handle the political part of the Tibet issue and His Holiness is our most revered leader. 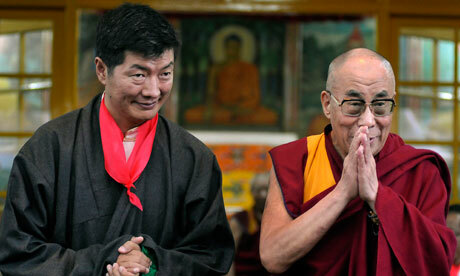 Now he spends more time on his spiritual pursuits but as a Tibetan he often makes comments on the Tibet issue as well. TSI: China is one of the world’s most formidable powers. Is there still hope for a free Tibet? LS: We perceive China differently from the way other countries, including India, perceive China. We Tibetans have been living side by side with China for centuries. China may grow powerful, but the Tibetan spirit, Tibetan sense of commitment and determination will not change. We believe that we will achieve freedom one day. That is the determination of the younger generation of Tibetans to carry the cause forward. Not just me, so many other Tibetans are joining in and have been in the Tibetan cause for a long time with sincere belief, that our day will come. We will return to Tibet.